Love 'Em or Hate 'Em, People are Wonderful. Or Morons. It can be really hard to tell sometimes. | Do Try This at Home: Love 'Em or Hate 'Em, People are Wonderful. Or Morons. It can be really hard to tell sometimes. Love 'Em or Hate 'Em, People are Wonderful. Or Morons. It can be really hard to tell sometimes. Whether they're visiting a hospital with Ebola and no one bothers to check them for it, or labeling peanut butter with the warning "contains nuts"...you just gotta love people. They're the best. 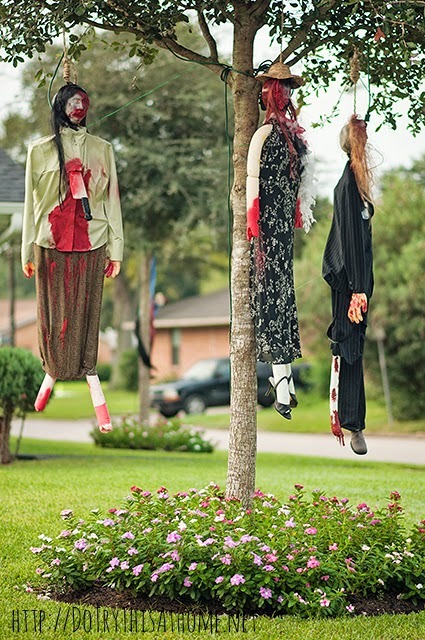 I particularly love whoever put up these friendly Halloween decorations a block from an elementary school. "What's the matter kids? Standardized testing for five year olds not scary enough?!? How about a guy with a knife through his head? Have a nice day at school!" On the other side of the house, the Zombies have out a barbecue grill and are roasting some kind of human body parts. The Boonga's two year old take on all the festivities? Me - "Is it scary?" 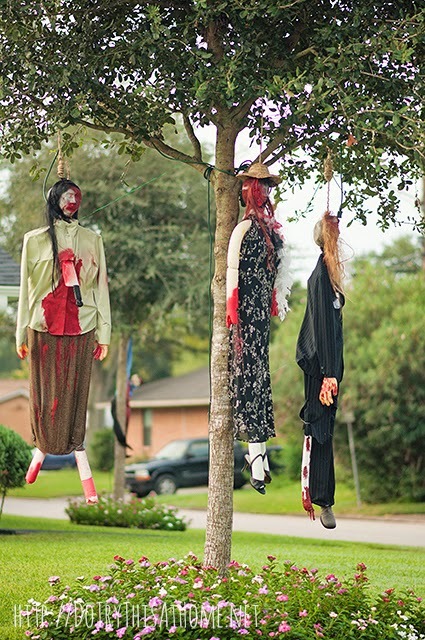 Me - "Well...some people like to decorate scary for Halloween. Some people like to decorate scary and some people like to decorate friendly." Her (sighing) - "Da Happns" (That happens.). 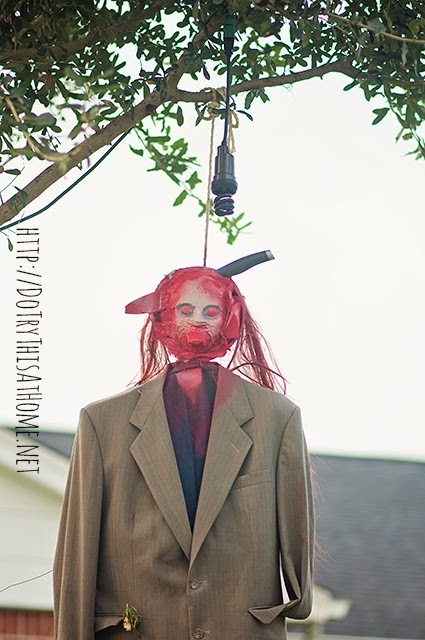 Hope everyone is enjoying that time of year when it is (apparently) socially acceptable to hang bloody people with severed limbs in your yard!!!!! 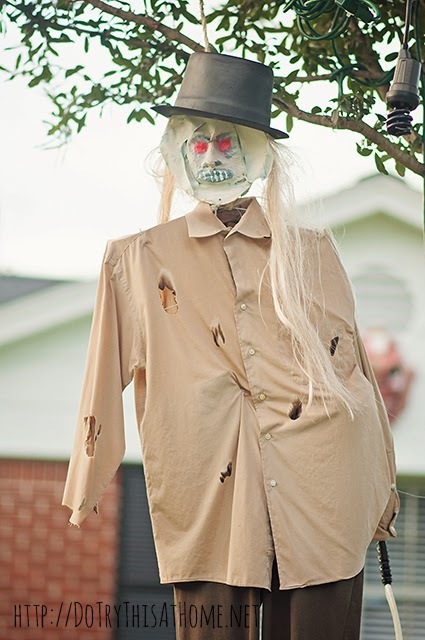 Yeah, I don't get the super scary yard decor. Keep it in the haunted houses, where you have to make the choice to see it. Give me black cats, witches, skeletons, ghosts and pumpkins. I guess I am old school. Wow that is a bit on the creepy side for being in front of one's house. While I enjoy scary decorations too, I tend to not put those front and center for all to see (and scare) heh. Sounds like your little one is taking the scary decor better than you are, teehee. You know Cid, Julie, & Tracy...it's not really that I mind the gore. And even right out front of an elementary school the way it is. I do find it kind of sad that I see kids DRAGGING their parents down the block trying to get past that house to get to school. And although I find people endlessly puzzling and amusing and horrible and wonderful (often all at the same time) it's just hard to imagine that somebody is purposefully trying to terrify all the little four and five year olds that have to walk past there every day. And yet...they probably are. Arizaphale - I don't know! I have to admit to having mixed feelings about these particular dead guys. I think if they were anywhere else besides RIGHT OUTSIDE an elementary school, I'd be fully appreciative of all the effort. But as it is...I'm kind of six of one half a dozen of the other. It's not like they can move just so they can enjoy better Halloween decorations. But on the other hand, I feel so sorry for the four year olds that had to walk past there each day.